It’s door-to-door sales without boots on the ground. It’s your company’s best foot forward and a conversation starter. Add your business to our iconic direct mail solution, The Blue Envelope®, to see new faces turn into regular clients. Valpak of Central Iowa also provides digital marketing tools, like mobile-friendly website development and increased online visibility with search engine optimization. The proof is in the results. And with Valpak, the results are all laid out for you inside a performance tracking dashboard. This performance-tracking tool gives you a unique phone number and URL so you can monitor call and click responses to your Valpak ads. Our dashboard identifies key performance indicators and empowers you to distill the numbers to find your ROI. Contact Valpak of Central Iowa to reach over 150,000 households in Des Moines, West Des Moines, Ankeny, Altoona, Clive, Grimes, Urbandale and many other communities. Valpak program and experience the difference for themselves. It’s the one that produces results! Justin Porter, Brown’s Shoe Fit Co.
For specific dates and coverage, contact your Valpak of Central Iowa representative. 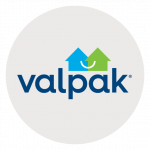 Valpak of Central Iowa is an independently owned Valpak franchise.